(Nanowerk News) Scientists have revealed a new technique to introduce disease-blocking bacteria into mosquitoes, with promising results that may halt the spread of diseases such as dengue, yellow fever and potentially malaria. When infected with the bacteria Wolbachia, mosquitoes are unable to spread viruses such as dengue, a disease which kills round 40,000 people each year with no vaccines or specific treatments currently available. 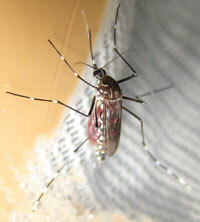 There have been around 2,400 cases of dengue infection in Northern Australia in recent years. However, the bacteria has been difficult to spread within the mosquito population because it reduces the mosquitoes’ ability to lay viable eggs. Now Professor Hoffmann from the University of Melbourne and Professor Michale Turelli from the University of California have shown that by introducing an insecticide resistance gene alongside the Wolbachia bacteria into the mosquito, that the insects pass on the disease-blocking bacteria to other mosquitoes faster. The results are published today in the journal Proceedings of the Royal Society B ("Facilitating Wolbachia introductions into mosquito populations through insecticide-resistance selection "). This could mean that the spread of disease can be stopped faster, and less infected mosquitoes would need to be released in a disease control program said Professor Ary Hoffmann from the University of Melbourne’s Bio21 Institute and Department of Genetics. “Our results show that Wolbachia-based strategies could hold the key to a cheap and sustainable approach to disease control,” Professor Hoffmann said. Wolbachia bacteria strains live naturally inside up to 70% of all insects and are known to protect them against viral infection. The disease-blocking strain of Wolbachia was first discovered in Australian fruit flies in 1988 by Prof Hoffmann, and trials with collaborators at Monash and James Cook Universities in 2011 showed that Wolbachia-infected mosquitoes were unable to spread the dengue virus. The approach taken in this new work involves adding a pesticide resistance gene to a newer strain of Wolbachia called wMelPop, which is a strong blocker of dengue and other viruses . Insecticide use is very common in dengue and malaria-prone regions and so this strategy should select for the survival of only the Wolbachia-infected mosquitoes, but then these insects would be unable to pass on a virus to humans. Prof Hoffmann added that insecticide resistance genes would not spread to the uninfected mosquito populations because a Wolbachia-infected female with a resistance gene will always pass on both the gene and the bacteria to her offspring. Then, when an uninfected female mates with an infected male, the bacterium causes cytoplasmic incompatibility, which leads to the death of embryos.